Nation's Best Hot Dogs -- on a Budget! Labor Day means backyard barbecues, picnics - and plenty of hot dogs. The hot dog is an American classic, so what better way to celebrate the traditional last weekend of summer than with the hottest dogs in the land? "The Early Show Saturday Edition" called in a top dog to lend a huge hand. Robert Irvine is the host of the Food Network's "Dinner Impossible," in which he's challenged each week to cook gourmet food in tough conditions on a moment's notice. We issued him a challenge of our own: serving as our "Chef on a Shoestring" this week and prepping a holiday weekend feast starring signature hot dogs from across the country - the tastiest ones out there - all on a limited budget. We usually give our "Shoestring" chefs $35 to work with, but we gave Robert a still-slim $70 to get the job done. And because of that "inflated" number, Robert wasn't entered in our "How Low Can You Go?" competition, in which the shoestringer whose ingredients total is lowest will be asked back to whip up our whammo year-end holiday meal. The hot dogs - or should we say weiners - or foot-longs - or franks? - Robert incorporated into the feast included the New York Papaya Dog, the Georgia Scrambled Dog, the L.A. Dodger Dog, and the Chicago Dog. He also made some sides. Among them: an Arugula Pasta Salad, Sweet Potato Bread Pudding, and Cinnamon Tabasco Ice Cream. Chicago-style hot dog is a steamed or boiled, never broiled all-beef hot dog on a poppy seed bun. The hot dog is topped with mustard, onion, sweet pickle relish (usually a dyed neon green variety called "Nuclear Relish"), a dill pickle spear, tomato slices or wedges, pickled sport peppers, and a dash of celery salt; sometimes, but not always, cucumber slices. The complete assembly is sometimes called "dragged through the garden" because of the unique combination of condiments. Ketchup is not used on a Chicago-style hot dog. 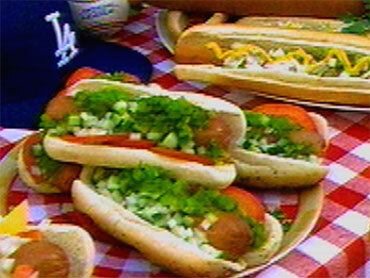 The Dodger Dog is a hot dog named after the Major League Baseball franchise that sells them (the Los Angeles Dodgers). This foot-long ballpark frankfurter wrapped in a steamed bun is consumed by millions over the course of the baseball season. The Scrambled Dog originated in Columbus, Ga. and is a cheap, usually red-skinned hot dog, served on a toasted white bun and topped with mustard and spicy chili. This particular chili contains beans and has large chunks of diced raw onion mixed directly into the prepared sauce before being spooned onto the dog. The Scrambled dog in its traditional configuration was invented at a now-defunct cigar store and newspaper stand run by Firm Roberts on Columbus' Broadway beginning in 1908. The most famous purveyor of the dog today is the city's Dinglewood Pharmacy; there it is topped with ketchup, mustard, chili with beans, onions, sliced dill pickles, and oyster crackers. In a medium pot with 6 cups water, over high heat, bring water to boil and season with salt and pepper. Next add cauliflower; boil 2 cups until cooked but still al dente (biteable but not mushy) remove and chill in the refrigerator until needed. The remaining two cups continue to cook until it's overcooked, remove and drain. Next in food processor, blend the two cups of over cooked cauliflower with ¼ cup heavy cream, puree. After cauliflower is smooth, remove from bowl and split into two. In a large skillet over medium high heat, melt butter then add onion and sauté until translucent, about 3-5 minutes. Next add bell pepper; continue cooking until the peppers beginning to soften, about 3 minutes. Then add corn kernels and sauté for 2 minutes and add half of cauliflower cream, thyme, and 1/2 teaspoon hot pepper sauce. Simmer until sauce thickens, about 5 minutes. Mix in green onion, parsley, al dente cauliflower and basil. Season to taste with coarse salt, pepper, and more hot pepper sauce, if desired. Bring 4 quarts salted water to a rolling boil in a 5- to 6-quart pot over moderately high heat. Stir in noodles and 1/2 cup cold water. When water returns to a boil, add 1/2 cup cold water and bring to a boil again, then repeat procedure once more. Test noodles for doneness (soba should be just tender but still firm and chewy throughout). Drain noodles in a colander, rinse well under cold water, and do not "dunk" in ice bath. Next, in large mixing bowl, toss noodles with sesame oil, cucumber, jicama and peppers. Finally add remaining ingredients to previous bowl and toss to coat all vegetables, then add to noodles; toss again to combine. I have made a Chicago Style dog with the traditional ingredients, but with my dog I have elevated the flavors and textures with the addition of Hendricks cucumber gin to the cooking and the texture with the addition fresh mango. Additionally, I like to combine the remaining ingredients into a cooked flavor packed relish. First to prepare relish, in a medium bowl, combine tomatoes, cucumbers, peppers and diced pickles. Next; in another mixing bowl combine the vinegar, seasoning and ground mustard, stir well, allowing flavors to blend. Then pour this liquid over previously prepared vegetable mixture. Then in sauce pan, over medium heat, cook relish until flavors have blended, ensuring not to overcook (medium doneness). Remove the relish from the heat, and hold warm or chill until using. This will be our relish base and can be made a day in advance; it should at least rest for 2 hours before serving. Next, boil dogs in water with seasoning and Gin, 4-6minutes, being sure not to over cook or split the skin of the dogs. Finally drain dogs, tap dry with a paper towel, then lay dogs into bun, add mustard between bun and dog, add pickle slices, raw onion, mango and top with strained relish. Finish with a dash of celery salt. Fill a stock pot 3/4 of the way full with water and bring to a boil. Then next add the hot dogs, reduce the heat to a simmer and cover. Cook until the hot dogs are plump, about 6 to 8 minutes. Remove from water, tap dry, and then place the hot dogs in the buns. Start topping the hot dogs with 2 slices tomato and 2 tablespoons of each: onions, cucumber, mustard and relish. Top with sport peppers to taste and sprinkle a little celery salt on top. On a griddle, heat dogs with butter or oil; brown the dogs until evenly browned on all sides. Next warm buns on griddle or in pan, then remove. Next add dogs to bun, and then add mustard, red onion sauce, kraut and mustard. Enjoy with a Papaya Drink. First in a large saucepan, heat oil over medium heat then. Sauté sliced onion for 5 minutes, until onions are translucent, softened. Next add water, tomato paste, corn syrup, cornstarch, salt, and red pepper flakes to onions and stir. Leave over heat and bring sauce to a boil, reduce heat to low and simmer for 30 minutes. Next add the vinegar, continue to simmer for an additional 30 minutes, or until the sauce is thickened. Yields 1 cup. FOR MORE RECIPES, GO TO PAGE 3. Steam hot dogs and warm buns on buttered pan surface. Next put hot dog in bun, then sprinkle oyster crackers over the dog and top with a couple of scoops of chili. The dog must be totally topped with chili, NO CHEESE. Finally top with mustard, chopped onion and dill pickles. Combine all ingredients and freeze according to the directions included with your ice cream maker, or purchase vanilla bean ice cream, blend in cinnamon and Tabasco, refreeze.